With Summer nearly over and school registration coming up fast, it is time to consider what we need to get our families ready for that dreaded “Back to School” frenzy. 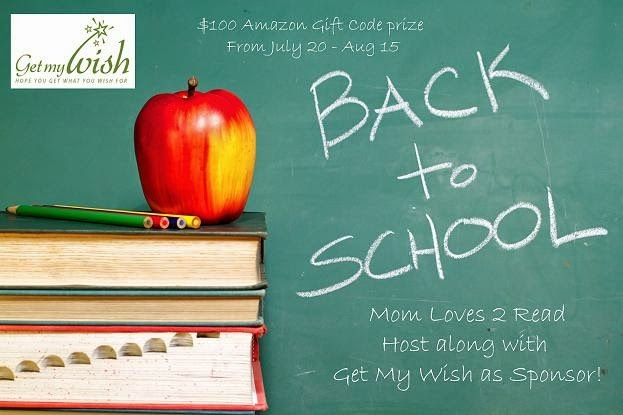 To make it easier, or at least a little less expensive, Get My Wish has partnered with Mom Loves 2 Read and some amazing bloggers to bring you a fun and fantastic Back to School Giveaway Bash! Step up to the challenge and start making a Back to School Wishlist to help organize those back to school needs! You can even do like me and make a different list for each child, and a separate one for my own personal wishes and wants! Don’t need a Back to School Wishlist? Then go ahead, register for FREE and make wishlists for birthdays, weddings, baby shower, anniversaries, Just Because, “I have to have it” list or even a “dreaming big” list! Whatever the occasion, whatever the gift, Get My Wish has a great way to organize it and share it with family and friends, or just make it for yourself! Get My Wish is all about making things easier to create, send and share your wishes, wants and needs with friends, family and co-workers all over the world. They even have a free concierge service that helps find the special gifts for that special person for any occasion. There are even different wishlist templates to personalize your lists, and Get My Wish makes emailing easy by allowing you to download your email contacts right into your account. Susan from Mom Loves 2 Read set up a Back to School List that you can check out here. It took less than 5 minutes to create a free registry, set up a wishlist and add several back to school items with descriptions! Simple. Easy. Ready to Share. Now for the Giveaway Fun. Enter below using the Giveaway Tolls form for a chance to win $100 Amazon eGiftCode to help with your Back 2 School shopping. Mandatory to create or have a Get My Wish registry. Open World Wide, must be 18+ to enter/win. Giveaway ends 11:59pm CST on August 15th. Entries will be validated. Winner will have only 48 hours to claim prize – no reply after 48 hours will result in another winner being chosen. Disclaimer: Neither Mom Loves 2 Read nor this participating blog are responsible for prize distribution. Sponsor: Get My Wish is responsible for sending prize to winner after validation. This giveaway is in no way associated with any social media.